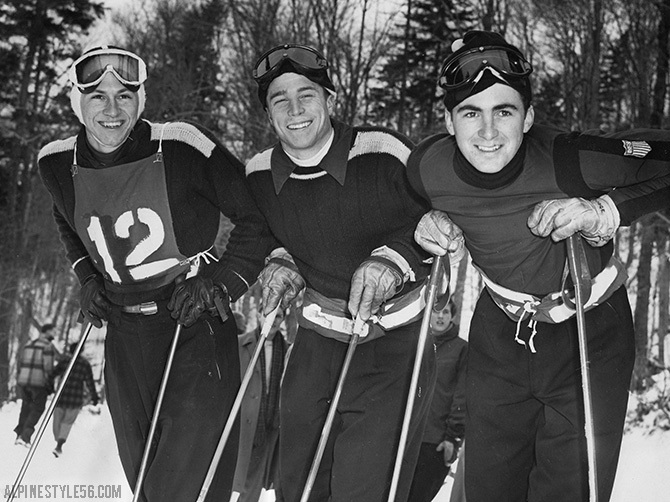 2/20/1953 Press Photo: This trio of crack Dartmouth skiers led a field of 38 from nine colleges to give the Indians an early lead today at Middlebury, Vt. in the Eastern Intercollegiate Ski Association’s championships. 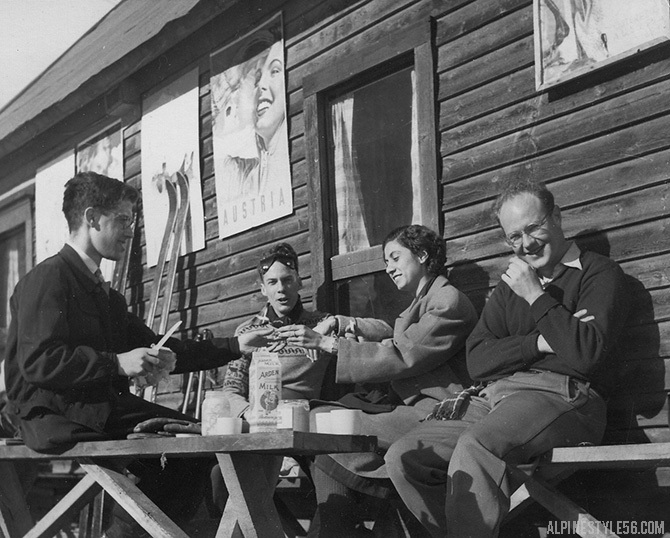 Left to right: Ralph Miller of Hanover, N.H.; Bill Tibbits, North River, N.Y., and Brooks Dodge, Gorham, N.H. 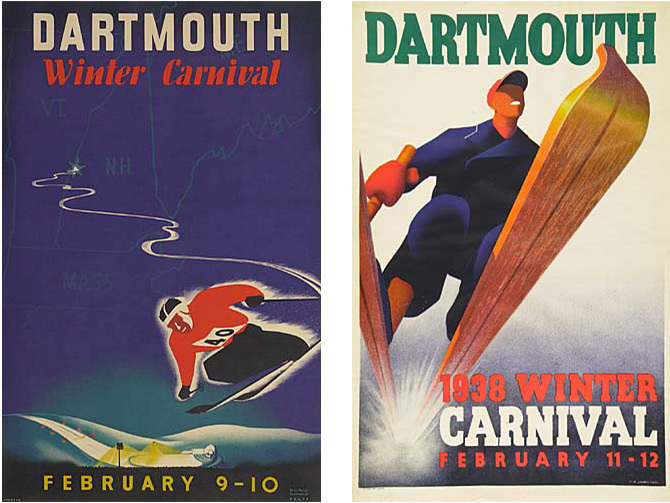 The legendary Dartmouth Winter Carnival is underway this weekend with EISA / NCAA alpine and nordic ski races headlining the schedule of events. 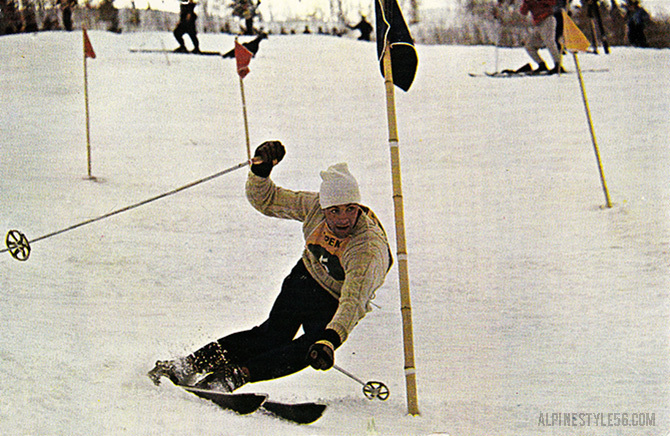 After day one, the University of Vermont Catamounts are in the top spot, Dartmouth in second, University of New Hampshire in third. 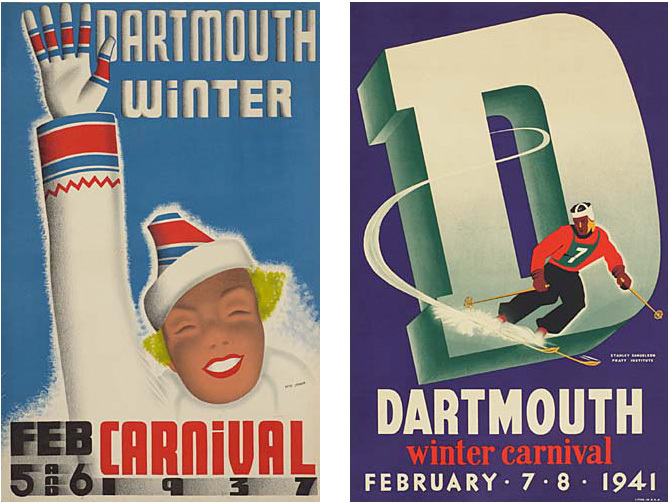 This history and lore of the Dartmouth Winter Carnival lives on in a vibrant collection of event posters. 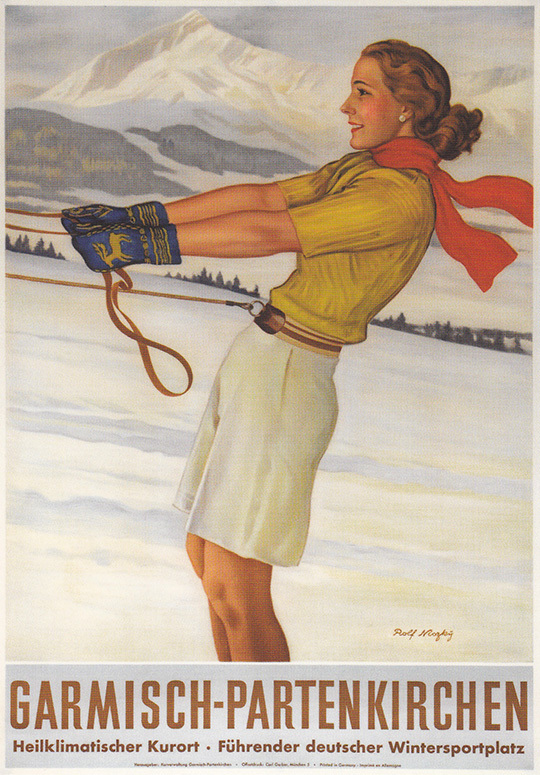 Highly revered and collectible, original posters are increasingly rare and demand a premium at auctions such as Christie’s and Swann Galleries annual poster sales. 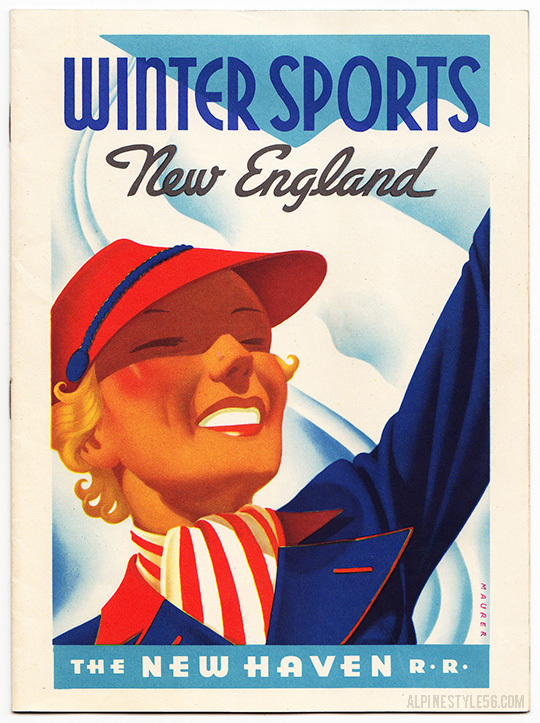 Click here to view an archive of Winter Carnival poster images from the Dartmouth College Library Collections. 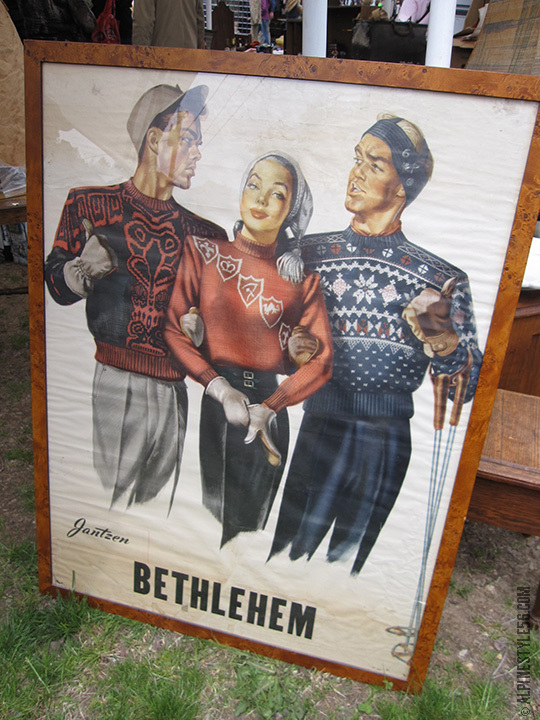 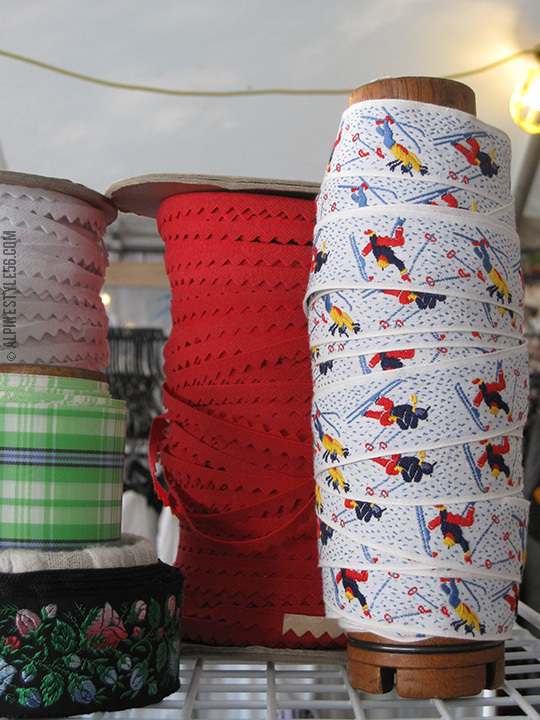 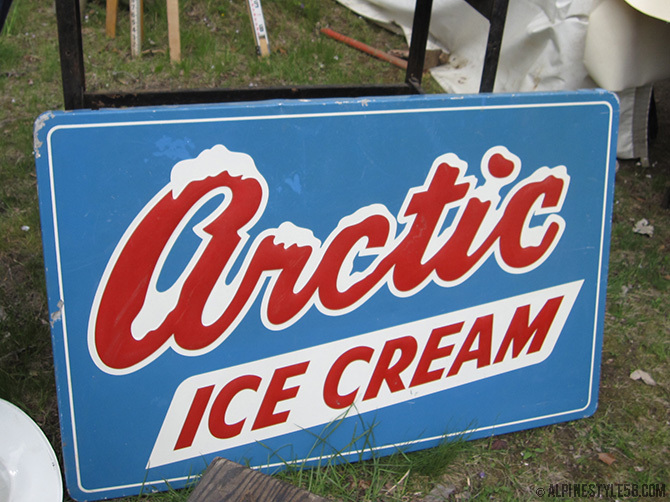 The first Brimfield Antique Show of the year didn’t feel particularly rich with alpine artifacts – but was great fun nonetheless. 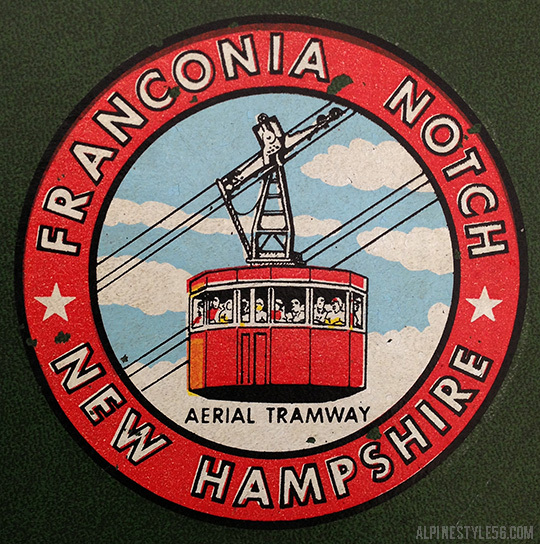 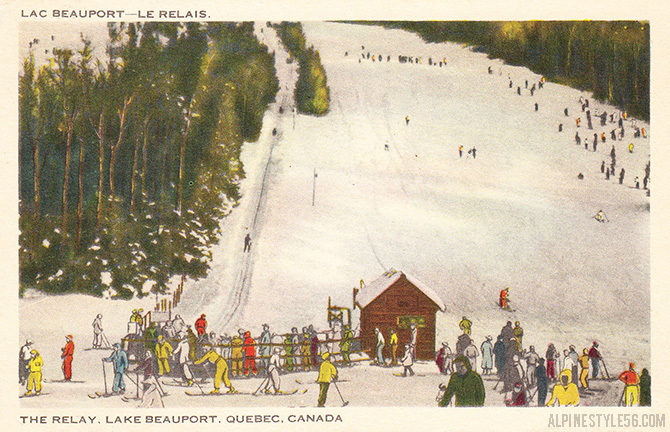 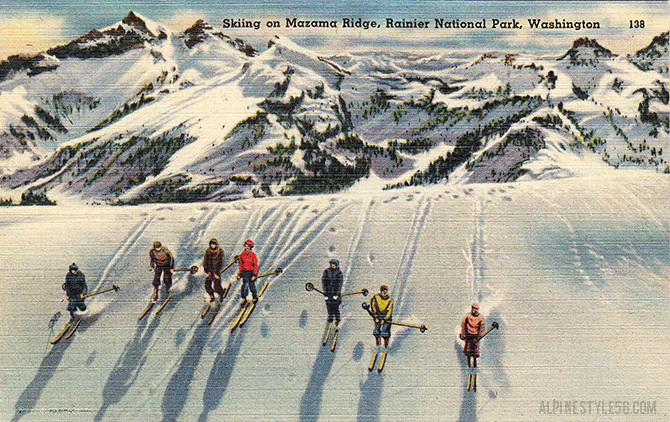 I rounded up some of the usual small finds: vintage photos, postcards, magazines. 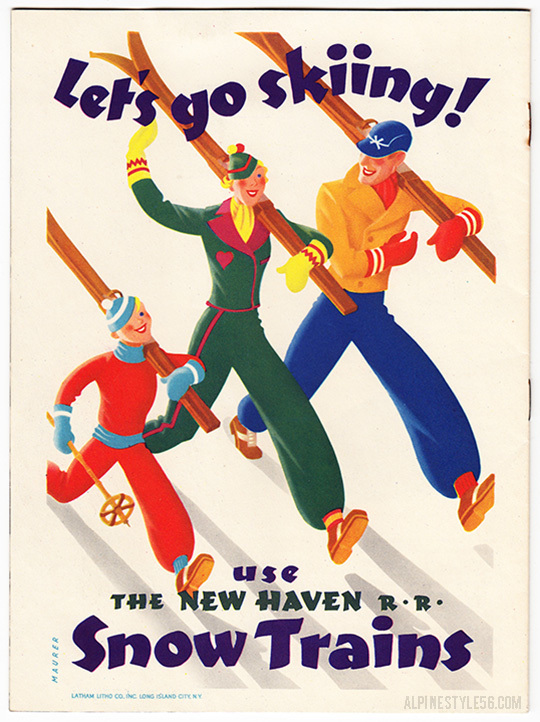 The score of the day was a late 1930’s brochure for The New Haven Railroad Snow Trains illustrated by famed artist Sascha Maurer. 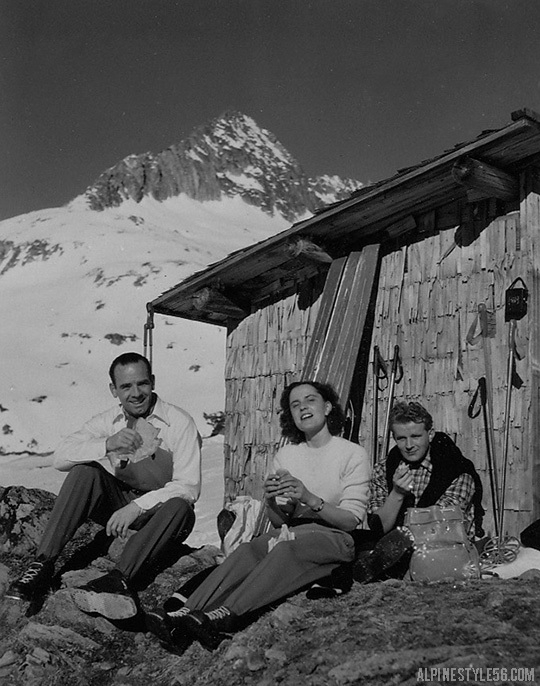 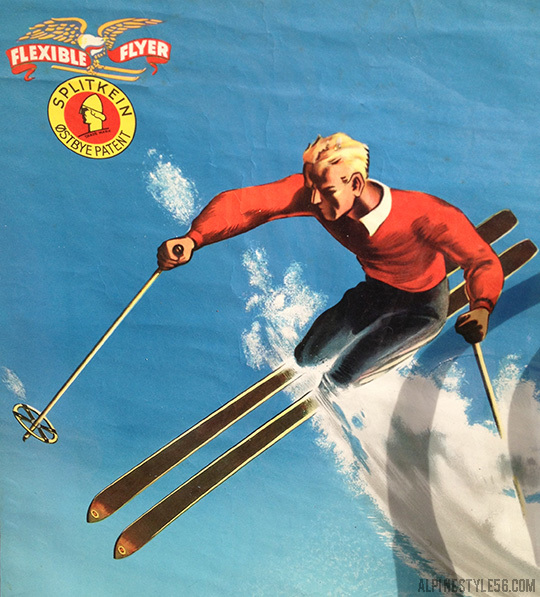 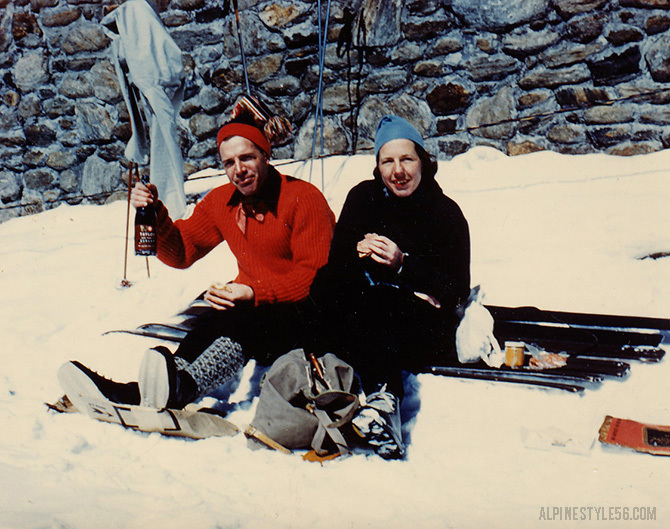 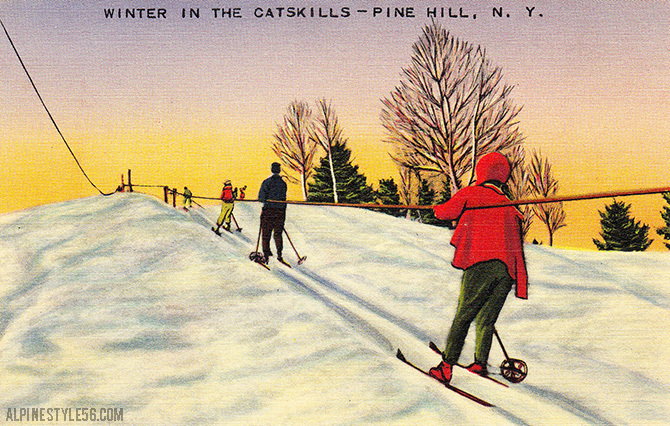 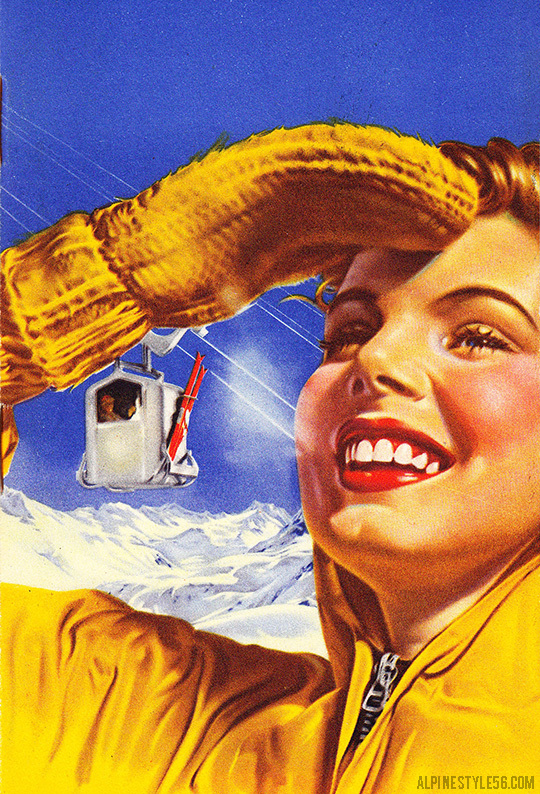 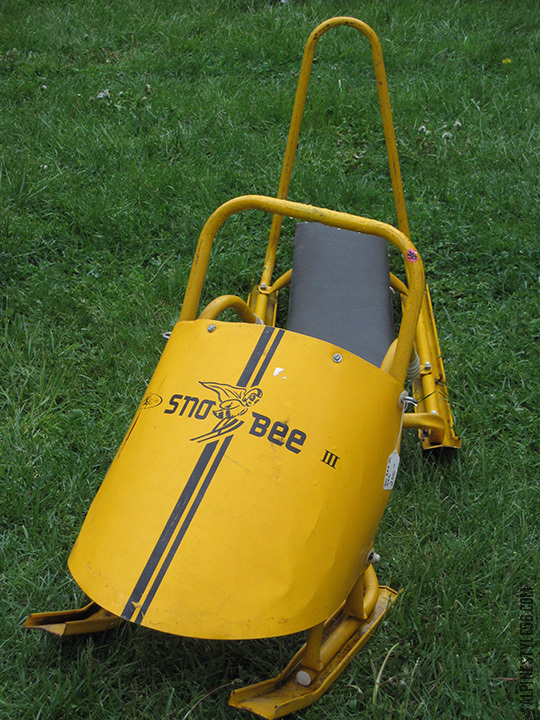 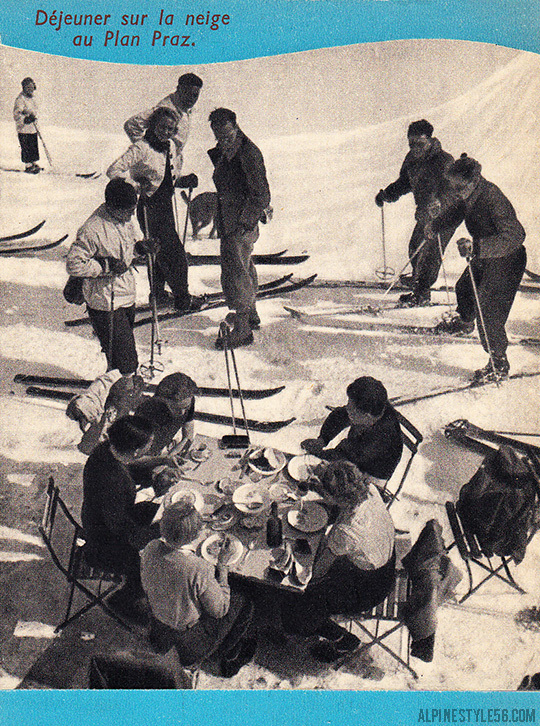 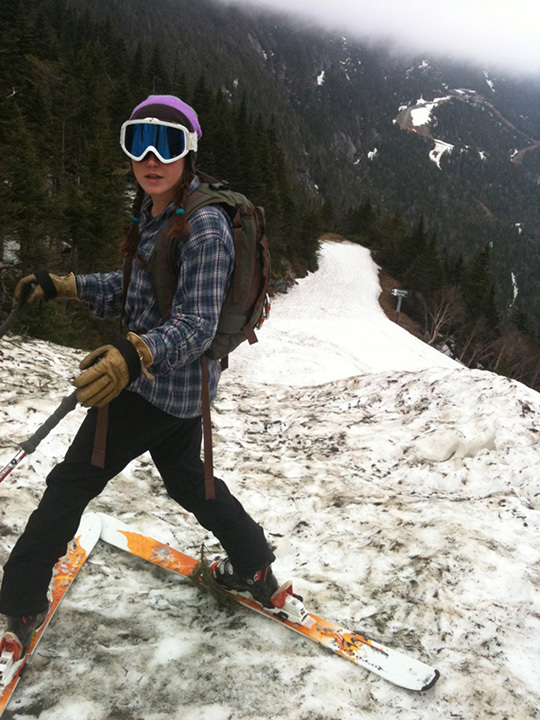 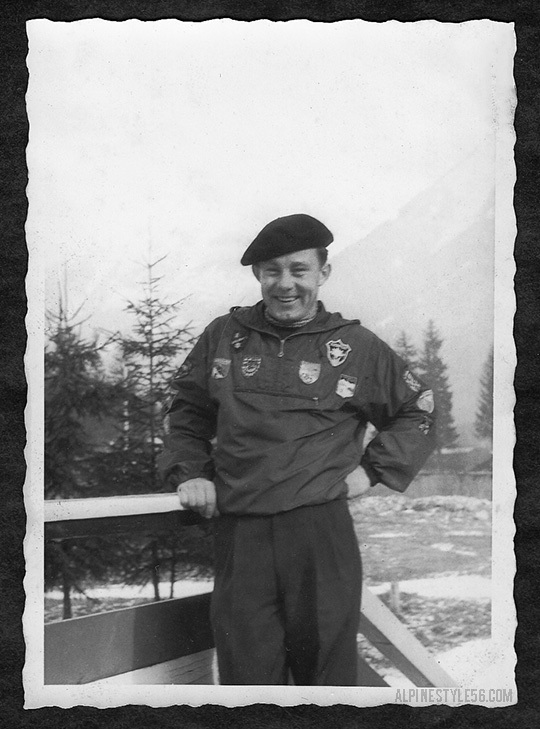 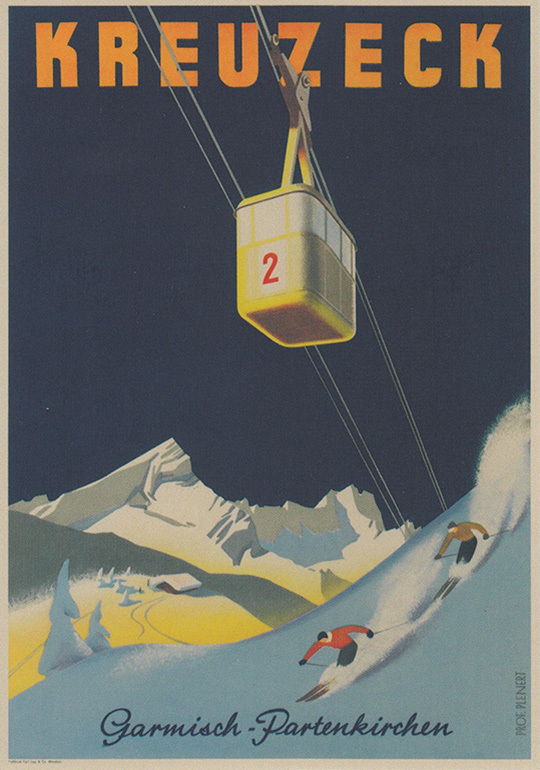 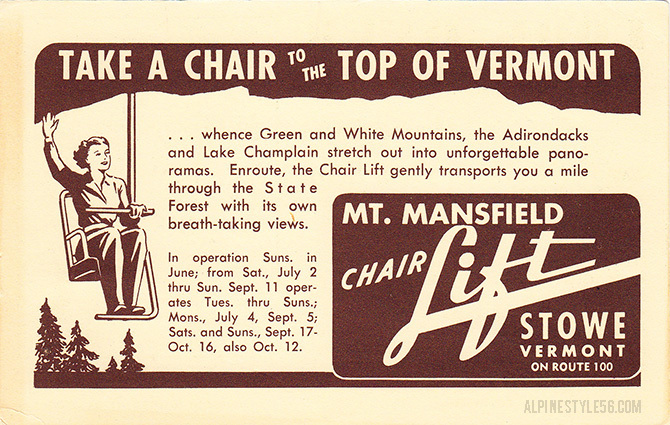 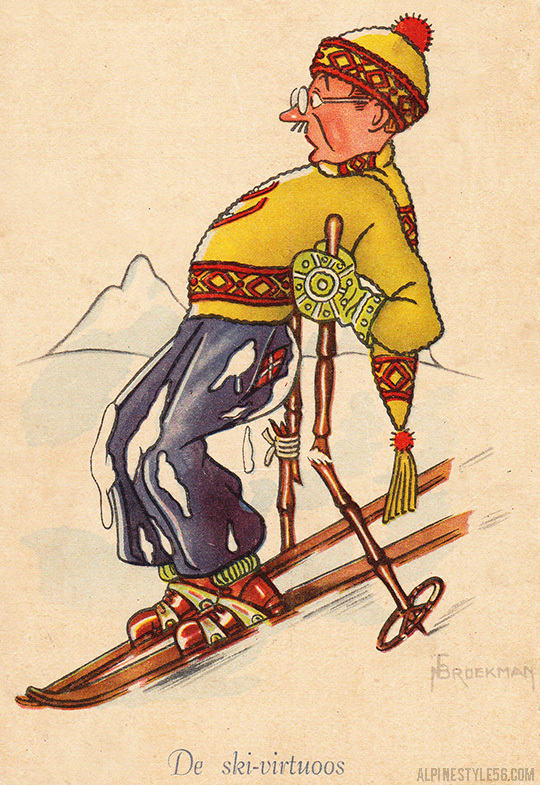 (Maurer is best known for ski posters and credited with creating the Stowe “flying S” logo.) 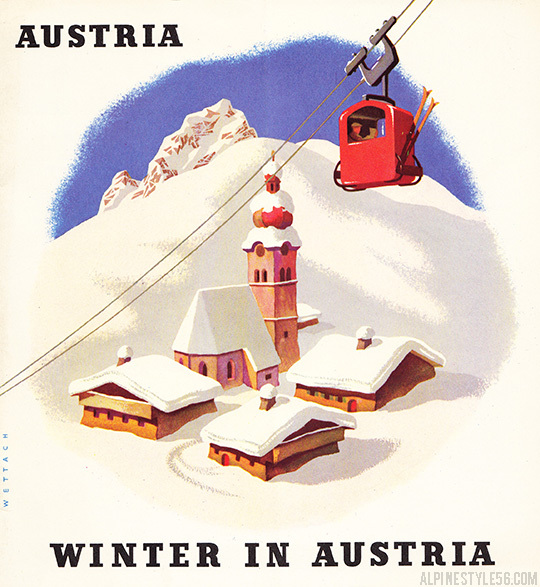 The brochure is in pristine condition with vibrant color and essentially gives me two mini posters – I am thrilled! 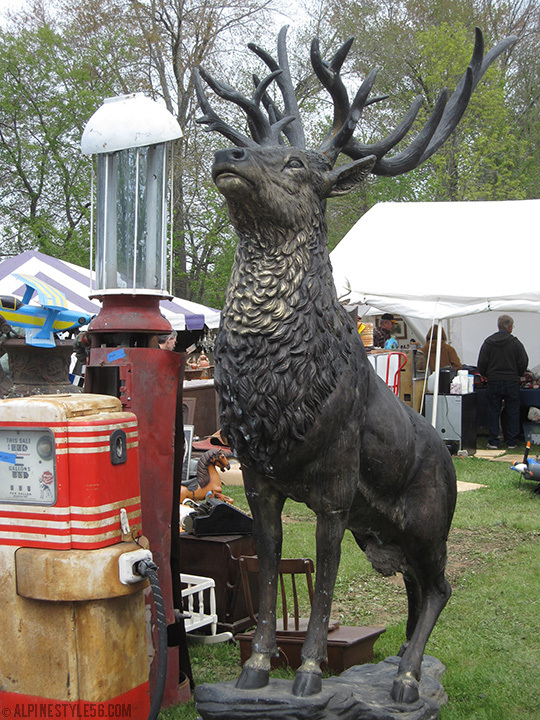 See you in September, Brimfield. 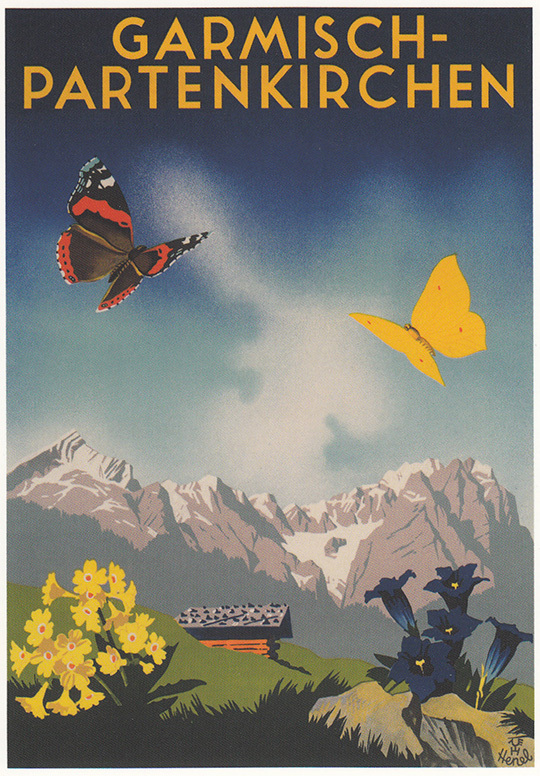 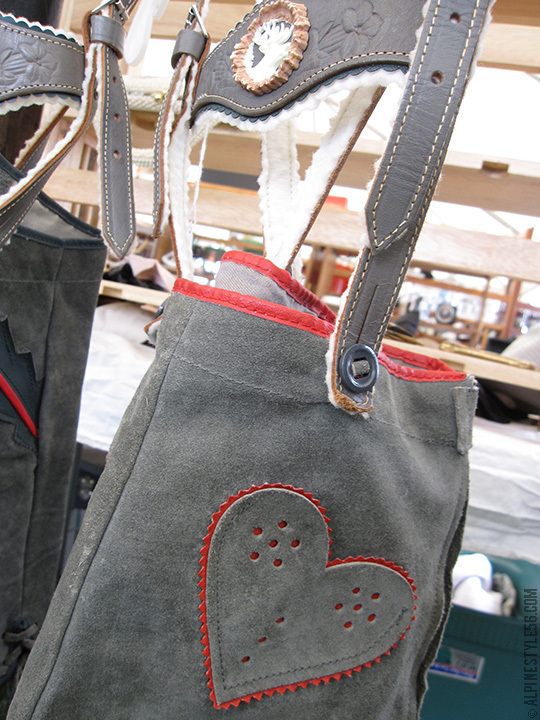 . .
GaPa, the Garmisch-Partenkirchen tourism agency, offers an impressive collection of premium souvenir merchandise featuring apparel and accessories by Maloja and vintage poster reproductions. 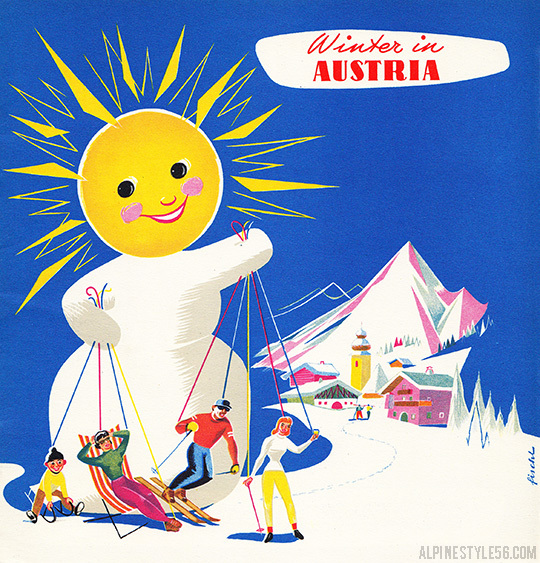 Here are a few of the winter poster images. 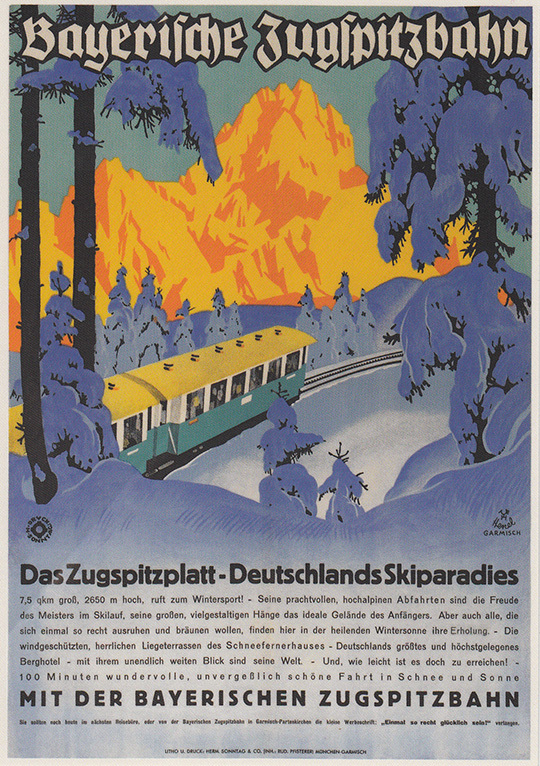 (It is only a matter of time until Kreuzeckbahn is framed and hanging in my home.) 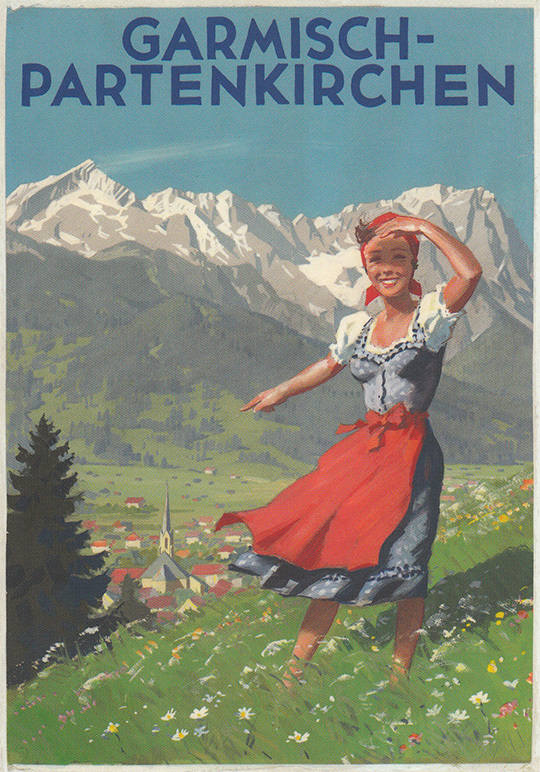 Summer posters to follow in a few months. 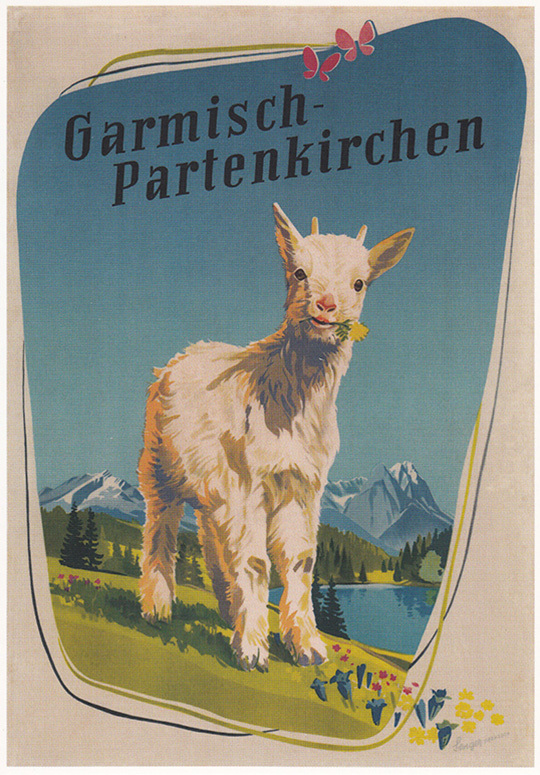 . .
Reproduction posters and other Garmisch-Partenkirchen merchandise may be purchased through the GaPa web store. 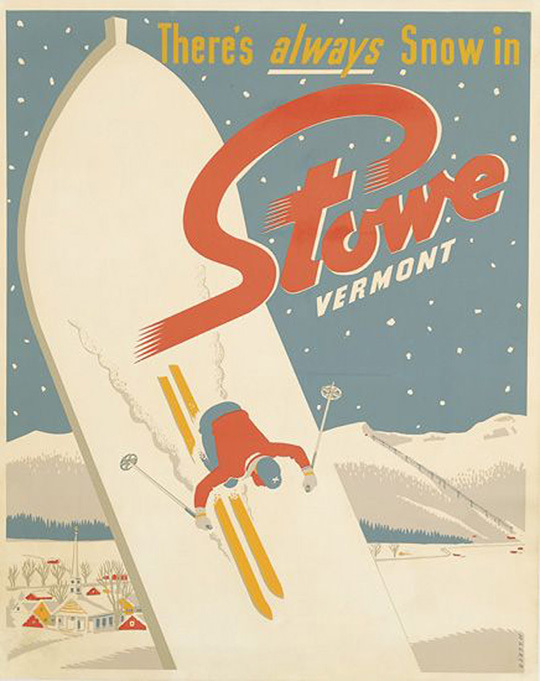 From Swann Galleries: One of the earliest appearances of the famous Stowe “S,” a logo which Maurer designed and which is still ubiquitously used in the Vermont town through the present day.